Records show that rye grain was used in scotch whisky production until the late 19th century. It is this tradition we have revived. 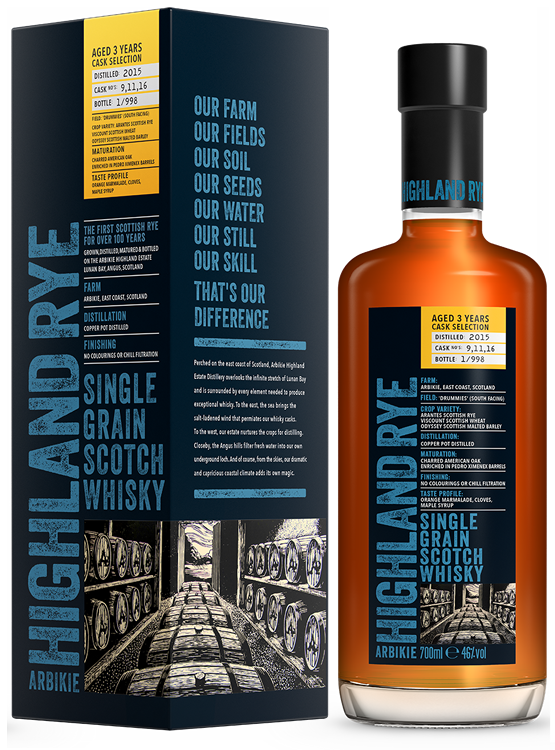 Using rye grown on our own estate, we have created a characterful Highland Rye Whisky that is bold, exciting and full of flavour. 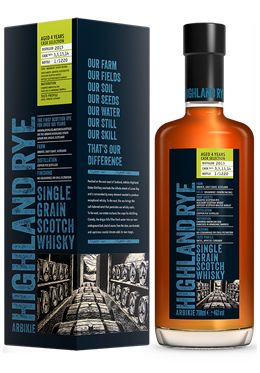 It is also proudly ‘single grain’—grain whisky produced at a single distillery. That distillery is Arbikie, where our team value tradition , authenticity and belief in our field to bottle principles. In 2019 we will release a further carefully selected 3 founder rye casks. These will be blended and finished in a style to be chosen by our Distillers. It is sure to be very special but extremely limited. There will only be about 950 bottles available. Perched on the east coast of Scotland, Arbikie Highland Estate Distillery overlooks the infinite stretch of Lunan Bay and is surrounded by every element needed to produce exceptional whisky. To the east, the sea brings the salt -ladened wind that permiates our whisky casks. To the west, our estate nurtures the crops for distilling. Closeby, the Angus hills filter fresh water into our own underground loch. And of course, from the skies, our dramatic and capricious coastal climate adds its own magic. Local records show Arbikie as a place of distilling since 1794. During these distant times all ingredients for the pot still would be taken from the immediate surroundings. Spirit distilling was a local craft, with a truly local flavour. It is this approach that inspired our own ethos. Provenance, traceability, authenticity and creativity are at the heart of everything we do. Ingredients for all our spirits are planted, sown, grown and harvested within arms- length of our distillery. We believe premium spirits can only be created from the highest quality ingredients and we are in the enviable position of being able to oversee impeccable standards every step of the way. The distillery is owned and run by the Stirling family and led by three brothers, whose childhood was spent on the estate where they gained an intuitive understanding of the land, passed from father to son since 1660. By clicking below you agree that you are of drinking age. By clicking below you also accept our privacy and cookie notice.